Island Peak is the most famous peak among the trekking peaks due to its location & relative ease to climb is situated in the Everest region. 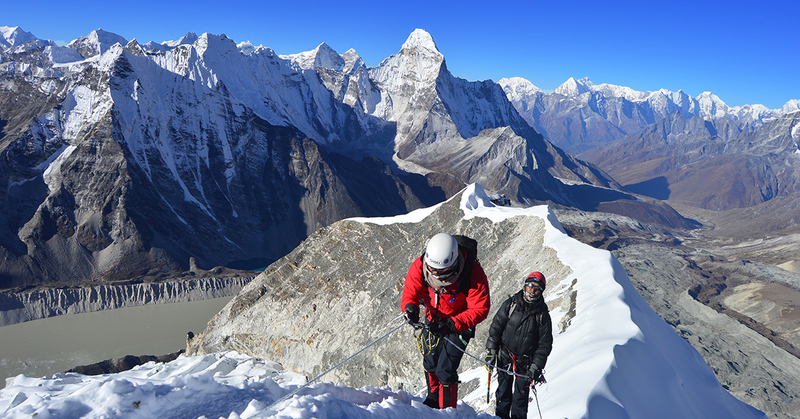 From the summit of Island peak Lhotse 8511m (4th highest mountain in the world), Makalu, Barunste, Nuptse, Ama Dablam, Cholaste, Lobuche peak and other peaks are visible in close range. 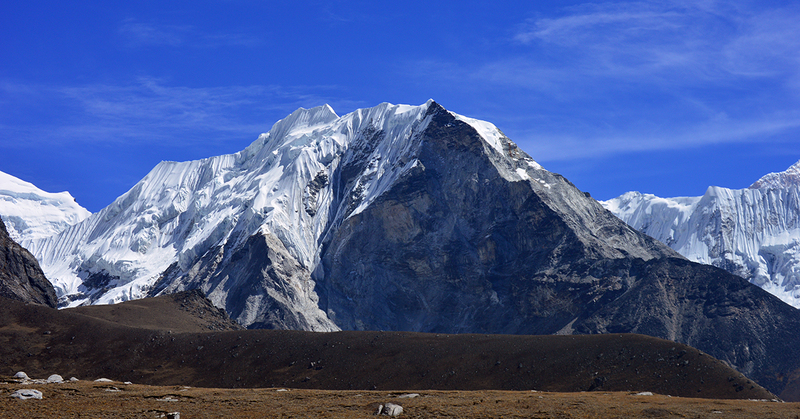 Island Peak (Imje Tse 6189m) is one of the main climbing peaks of the Everest Area. The mountain was named Island Peak in 1952 due to its striking location in the middle of the Chhukung valley, like an Island on a sea of ice. It was renamed Imje Tse in the early '80s, though its original name is still more popular. 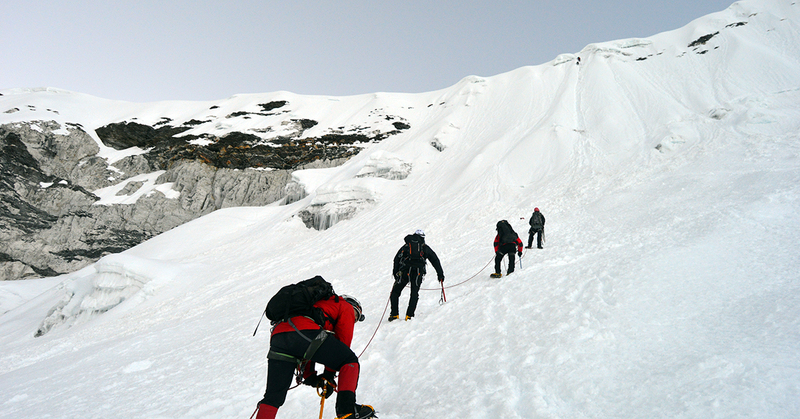 Island Peak has an impressive, highly glaciated West Face that rises from the Lhotse Glacier. 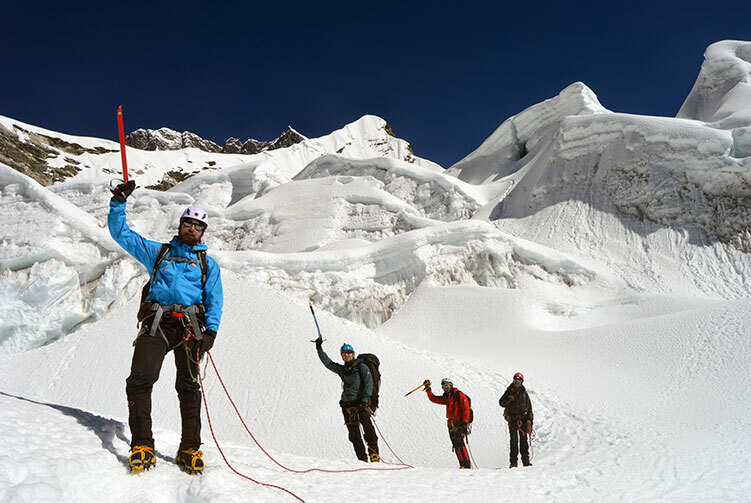 In fact, the mountain extends from the South Ridge of Lhotse Shar and is separated only by a small col. above this gap which is the ridge leading to summit. 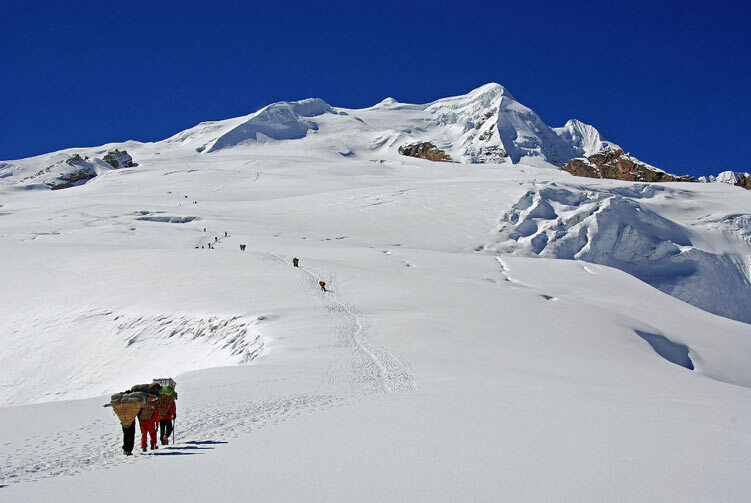 From the Base Camp, you will have to ascend a steep, grassy slope with small rocky steps to High Camp. 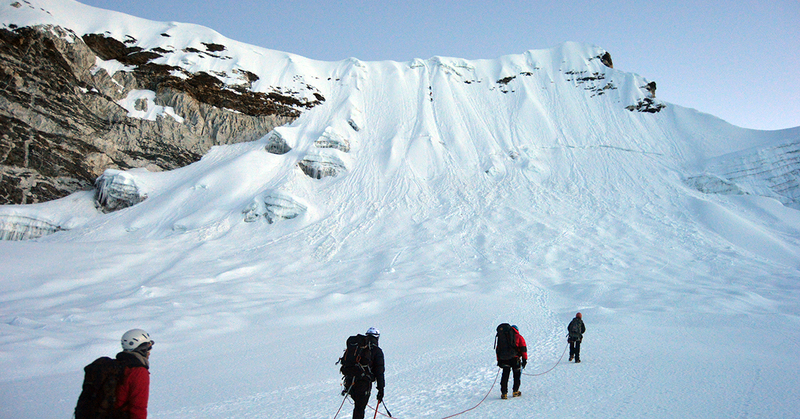 From here it is necessary to climb a steep, exposed snow and ice ramp to the summit ridge; fixed ropes will have to be used where necessary for a safe ascent to the top. 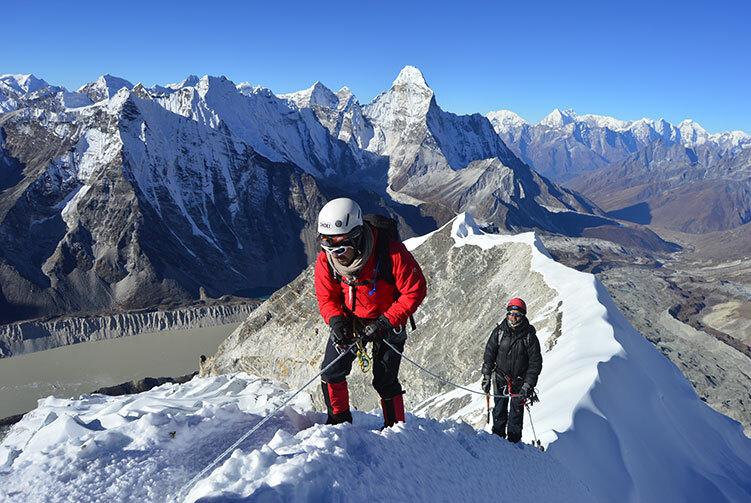 This climb requires more technical expertise than other climbs, however we will make it easier for by providing you with a technically proficient Sherpa climbing guide who is known for his knowledge of scaling high mountain peaks. Day 13: Island BC - High camp 5400m. Day 14: High Camp - Summit 6160m. & Back to B.C. Accommodation in Tented Camp while on Island Peak Base Camp. Island Peak Climbing permits and TIMS Card fees. 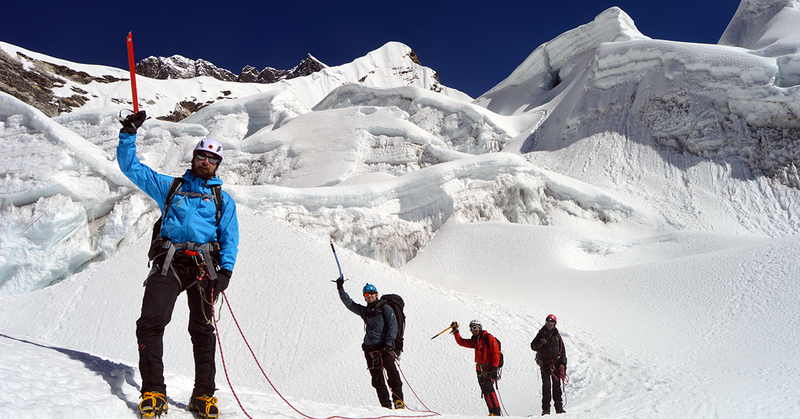 Island Peak Climbing group climbing gear, climbing rope, snow bars & carabineers etc. 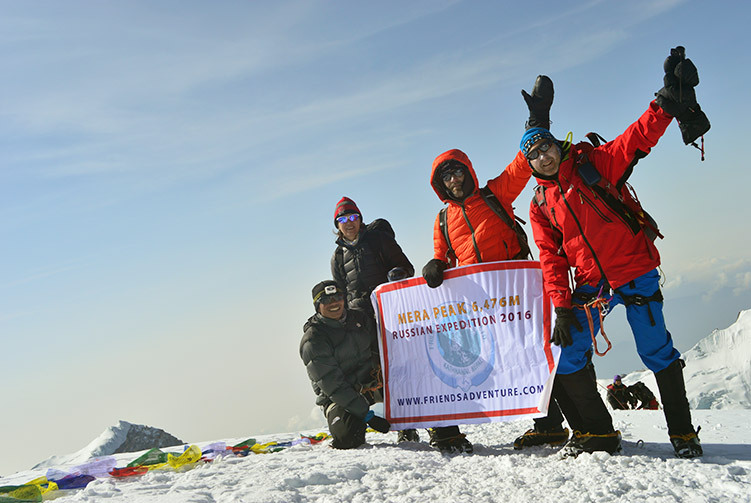 We offer you the best price guaranteed for Island Peak Climbing via Everest Base Camp Trek Expedition.